This graphic is from John Taylor, who plots it using quarterly seasonally adjusted data from 1990Q1 to 2010Q3. Investment here is fixed investment. 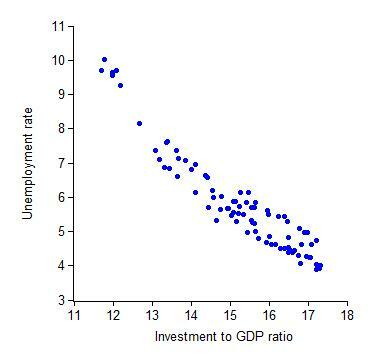 Of course, causality goes in both directions: Strong investment demand leads to lower unemployment, and a stronger economy, reflected in lower unemployment, encourages investment spending. As a result, the interpretation of this scatterplot can be debated. But there is no doubt that the strength of the correlation is impressive. Updates: Justin Wolfers takes John Taylor to task. John responds.